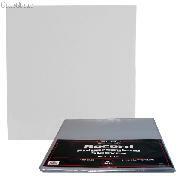 We are pleased to offer for sale this 100 Pack of Record Sleeves by BCW. These Record Sleeve Bags are an acid free, archival quality product made of crystal clear polypropylene. The polypropylene used in the Record Sleeve Bag has a 2 mil material thickness and will not harm your record albums. Each Record Sleeve is made to hold a single or double 33rpm record album. The super clear plastic makes the Record Sleeve a perfect way to showcase and preserve your collectible records. The record album slips right into the top of the Record Sleeve Bag. These Record Sleeves are new from our inventory and come in a pack of 100. Each Record Sleeve Bag measures 12 3/4" x 13".